If you are looking for a prefect mix of spicy and citrus for your corn, you are in the right place. 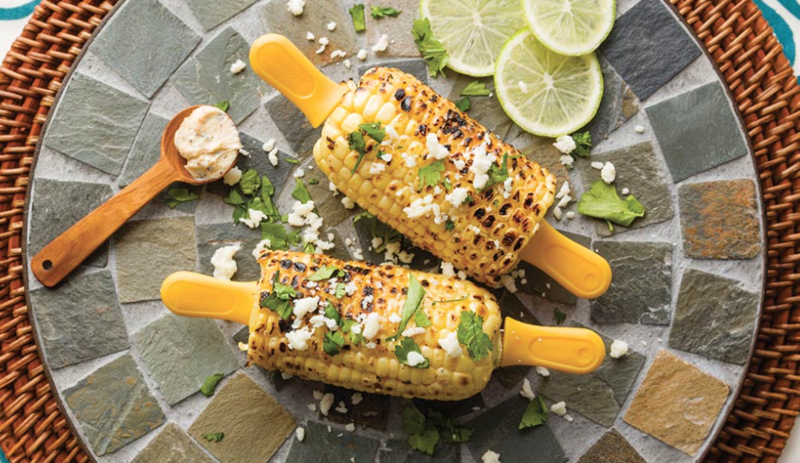 Mix butter, lemon-pepper, lime oil, salt, garlic powder, cayenne pepper, and brush over grilled corn. Top with freshly chopped cilantro, Cotija cheese, and a squeeze of fresh lime. 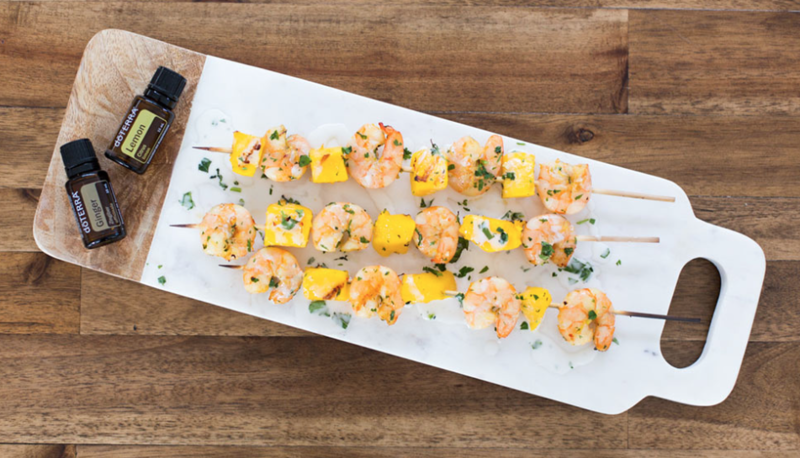 These Ginger Shrimp and Mango Skewers are sure to become a tried and true favorite. Place raw shrimp, olive oil, crushed red pepper flakes, lemon zest, garlic, essential oils, cilantro, and salt and pepper into a gallon-sized plastic bag and shake mixture until evenly coated. Marinate for 1–24 hours. Note: Soak wooden skewers for at least one hour in water before grilling. Put all of the crema ingredients in a medium bowl and whisk to combine. Note: The crema can be made hours in advance or right before grilling. Assemble skewers, alternating shrimp and mango. On a hot grill, cook the skewers for two to three minutes per side. Tip: Only turn skewer over one time to create grill marks. Put skewers on a serving platter, drizzle with crema, and garnish with fresh chopped cilantro. Natural food-colorants are hard to come by and can sometimes add a funny flavor to your favorite treats. 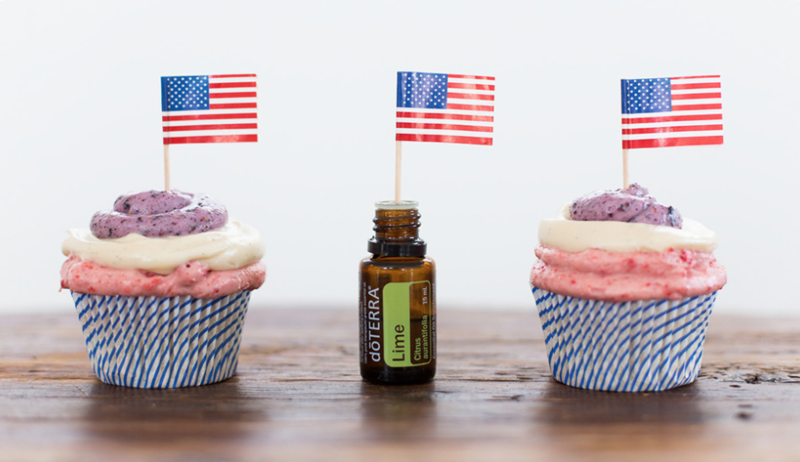 These patriotic cupcakes are dyed with freeze-dried fruit and add a delicious berry flavor to your already-loved cream cheese frosting. Mix dry ingredients on slow speed for two minutes until blended. Add the soft butter and mix in until evenly crumbly. Add egg whites one at a time, then add one whole egg, beating well after each addition to begin building the structure of the cake. Scrape down the sides of the bowl with each egg addition. In a small bowl, whisk milk with vanilla and Lime essential oil. Add to the batter ⅓ cup at a time. Beat one to two minutes after each addition until fluffy. Scrape down the sides and bottom of the bowl. Pour batter into prepared pans and bake for 25 to 30 minutes or until a toothpick inserted into the center comes out clean. Remove from oven and cool completely on a wire rack. With an electric mixer, and using the paddle attachment, not the whisk, mix the butter and cream cheese together for about three minutes on medium speed until very smooth. Scrape down the sides and bottom of the bowl to ensure even mixing. Add vanilla bean pod or extract and mix. Slowly add powdered sugar. Keep adding until you get desired sweetness and thickness. In two separate plastic bags, add freeze-dried strawberries and blueberries. Using a rolling pin, roll on top of freeze-dried fruit until they are small crumbs. Add crushed freeze-dried strawberries and blueberries into separate bowls and stir to combine. In the third bowl of plain frosting, add one drop of Lime essential oil and stir to combine. Add each frosting into a separate pastry bag. If you don’t have pastry bags, you can put it into a plastic baggie and snip the corner of the bag. Using a pattern of red, white, and then blue, gently pipe a small layer of each frosting onto cupcakes. Once done, you should have a beautiful and tasty patriotic cupcake. For an extra flair, add an American flag toothpick on top.